I miss cafeterias. There isn’t an honest-to-goodness old fashioned cafeteria within hundreds of miles of my house. We’ve got plenty of buffets, sure, and they offer choices, but all-you-can-eat isn’t the point. Automats are fun but they don’t come close to the cafeteria experience. Putting in your money and watching food come out of a slot is a novelty, but it can’t duplicate a cafeteria’s piping hot steam tables or the beds of crushed ice with tiny dishes set inside like jewels. In the 1950’s, on visits from our home in the Deep South to our Glendale, California grandmother’s house, my brother and I begged to go to Clifton’s Cafeteria. At the Pacific Seas on Olive Street in downtown Los Angeles, with Gramma in the lead, we’d dash to find a seat near a waterfall. Entrance to Clifton’s Pacific Seas, (sadly, now extinct) which also featured a giant waterfall built into the facade. Clifton’s Pacific Seas interior featured Tiki huts and tropical sound effects. On the way out, we kids chose a toy from the Treasure Chest. At a cafeteria you go down the line and put together your own version of the best meal you can imagine. One day you crave macaroni and cheese but you’d like a little something else on the side. Or you have a hankering for cornbread and everything else is selected in terms of how well it complements the bread. In a cafeteria, we didn’t need to explain our choices to anyone. We learned how many kinds of puddings there are, and marveled at all the ways Jell-O can be served. In fact, the smaller than home-size dishes were part of the charm. You could go back for more, but most of the time we didn’t. A cafeteria reinforces the eyes-bigger-than-the-stomach urge. We filled our trays with an armada of tiny bowls and plates, lined them up in front of us and whatever we didn’t finish, someone else at the table always did. 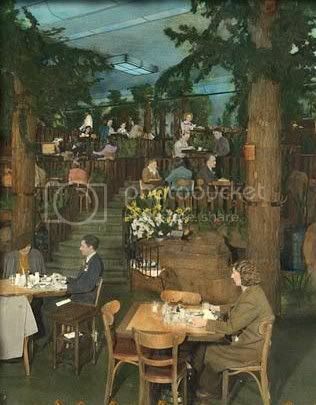 Clifton’s Brookdale Cafeteria, still in business on Broadway in downtown Los Angeles. It’s called the largest public restaurant in Southern California, seating 600 at once. Still, it feels cozy inside – like the lodge in the redwoods it was created to emulate. “Big” doesn’t begin to describe the inside of a Clifton’s. Inside the Brookdale, for instance, there are several levels for dining and a small chapel that’ll play you a recorded blessing before you leave. Jell-O at Clifton’s. Let me count the ways. What this country needs is more cafeterias, but if that way of dining isn’t coming back, perhaps we can compromise on a tasty alternative. We could make a new rule that every town must have a small cafe or diner every few blocks. Affordable. Nothing deliberately retro-chic, just real food at real prices so it could serve a diverse clientele. 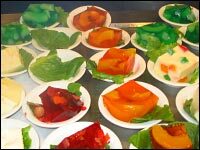 And every one of these places should be required to offer a blue plate special every day, with a choice of Jell-O flavors and at least three kinds of pudding, with mandatory Tapioca. I like to think I’m helping to teach our toddler a few important life lessons. Denial, for instance, can be a useful tool. It takes years to learn the nuances, but I’m pleased to say I see signs that the three year old is well on her way. It’s a long drive, the 400 mile journey to visit my family. It’s a trip I make every few weeks. After our initial greetings, I often like a little quiet time. Recently I said hello and then, to the jumping, hopping, running, climbing little girl, I said Hammy is tired from the drive. I think I might need a nap. The very thought mobilized the three year old, who hasn’t napped since she was two. I reassured her that no one was trying to persuade her to do such a thing. You don’t have to nap, I said. You can play, but Hammy is tired. Okay, one story. I sat down on the couch. Why don’t you go pick a book and bring it to me? We knelt by the bookcase. I picked the first title I saw, How about …. But before I could make a suggestion, she had quickly pulled out three different stories that cover similar subject matter – saying goodnight. A couple of the “moon” books and another about tiny creatures in the animal kingdom getting tucked in by their parents. She plopped the books onto her bed and scrambled up. I’m so proud. She’s already adept at denial. Her classic I’m-a-big-girl-I-don’t-need-a-nap ploy is proof that my work has not been in vain. Wisteria is in bloom everywhere I go. The blossoms hang suspended, moving slightly in the breeze, like lighter-than-air bunches of grapes. Wisteria decorates the arbor in front of the drugstore. It bends over cottage fences. It nestles alongside gateposts and climbs on old redwood frames built long ago, out of respect for this lavender phenomenon. In this mild Northern California climate, Wisteria prospers, and every spring, when we’re rich in blossoms, I remember a coming-of-age visit decades ago to one of the world’s most spectacular Wisteria displays in Southern California. In my teens I sang many Saturday nights at a giant auditorium in downtown Los Angeles, under the auspices of Youth For Christ. The onstage bands were composed of famous musicians mixed with young performers from all over Southern California. A competition sponsored by the organization was announced, to decide the members of an all-star band to tour the state. Our local group sponsor, Curtis Correll, encouraged me to enter and he worked with me on the songs I’d sing along the way. Here and now in another spring, Wisteria still holds a fascination. Breezes carry petals from the flowers into the air and on our daily errands we walk through clouds of lavender. I’m not the only one stepping over the fallen petals on the sidewalk in front of the bank, reluctant to disturb their formation. I’m not the only one who stops to study the ways they arrange themselves on the ground. The individual petals have massed into waves of color that look as if they’re painted there. Breezes will rearrange the waves many times before all the Wisteria blossoms are gone. It’s the work of spring to create these flower pictures. It’s also the work of spring to stir memories of a lavender-colored youth. *The City of Sierra Madre assures us the famous vine escaped damage in the recent fires.